For a player with Cole’s numbers, it’s somewhat of a surprise that he’s not more heralded. 66 sacks in 7 years are very decent numbers, and he’s had no less than 9 since 2007, peaking with 12.5 on two occasions. He does have 2 Pro Bowls selections to his name, as well as an All Pro vote in 2009, but it’s perhaps his narrow(ish) skillset that limits his overall appeal. Cole is a formidable pass rusher, as his sack numbers indicate, but despite being converted from a DT at Cincinatti, the DE has sometimes struggle to offer the Eagles much in terms of run stuffing. In 2011, this was due in a large part to Juan Castillo’s defensive scheme that lined Cole up in a wide-9 technique, designed to give him a great angle to the QB, but making him fairly impotent against inside running. 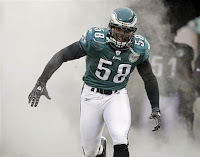 Cole signed a 4-year contract extension in March which ties him to the Eagles through 2017, which will give him a great chance to move closer to the Eagles all-time sack leaders Reggie White (124) and Clyde Simmons (76). Tasmanian Devil. Head and Shoulders spokesman. Perennial Pro-Bowl safety. Troy Polamalu was ranked #6 by the NFL players in their list in 2011, but none of us saw fit to rank him above 44 (despite him eventually finishing 39th due to our scoring system). His skills are absolutely undeniable. As a strong safety he hits harder than some linebackers, and his athleticism and instincts make him a real backfield threat even when coming from deep. However, Polamalu has benefitted in recent years from being part of a Steelers D that is absolutely loaded with talent, and this may have gone some way to cover what some see as his short comings in the passing game. Thanks to the Steelers front 7s ability to pressure opposing QBs and dominate their opposite numbers on the OL, few quarterbacks have the time to fully set in the pocket, and receivers have a reduced time to get open. 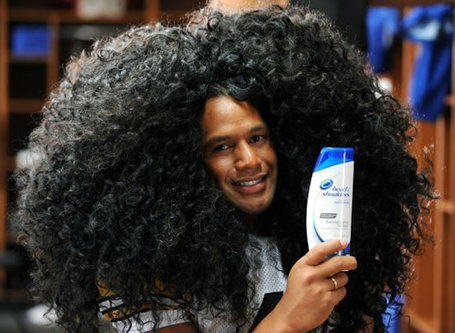 Because of this, the fact that Polamalu isn’t actually that good in coverage is very rarely exploited. That said, if Polamalu is in the right place when the ball leaves the QBs hands he has an uncanny ability to make spectacular interceptions, and it’s big plays like those that make him so memorable to fans and players alike. No, not the 49ers receiver who’s muffed punts cost them a Superbowl visit. 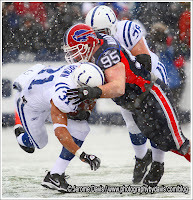 The Bills defensive tackle, drafted in 2006, has overcome a lot of critics to make it onto our list at 38. Coming out of Louisiana St he was considered too small, too short, and not athletic enough to play DT at the next level, despite earning All-SEC and second team All-American honours as a senior. The Bills got an absolute steal with the 134th pick, as Williams has evolved into one of the best run stuffing DTs in the entire league. He fought hard and got his first start for the Bills in his rookie year, and by 2009 made it to the Pro Bowl as an alternate. But it was his 2010 campaign that got him the most plaudits, as he again made the AFCs Pro Bowl roster, and was named the top defensive player of the year by Pro Football Focus. He was rewarded with a 6-year, $39million contract. 2011 was less successful for Williams, who hit IR before week 10 due to an on-going foot injury. Returning in 2012, he can take his spot next to Marcell Dareus at DT with Mario Williams outside at DE and be part of what may be a D line poised for a breakout season. The first of five offensive linemen in this Sunday selection, and my personal #1. After arriving from Boise St in 2008, Clady quietly went about completing a rookie season that should have earned him Rookie of the Year honours. He started every game, gave up just 0.5 sacks, and committed only 3 penalties on his way to finishing 3rd in the ROTY voting behind Matt Ryan and Chris Johnson. Of course, in 2008, Clady was blocking for Jay Cutler. Since, the Broncos have been less blessed with QB talent – Kyle Orton and Tim Tebow to be precise. In 2011, Clady came in for some criticism, allowing 9 sacks on the year despite the Broncos ranking 32nd in the NFL in pass attempts. What the stats don’t tell is that Clady was having to deal with a difficult QB Option offence put in place for Tim Tebow, as well as a QB with some of the worst passing statistics and slowest throwing motion in the league. Putting a better, smarter, QB behind Clady will give him a huge boost. Someone like Peyton Manning perhaps. 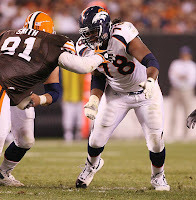 Provided he continues to stay healthy, Clady will be an All-Pro tackle in 2012, mark my words. 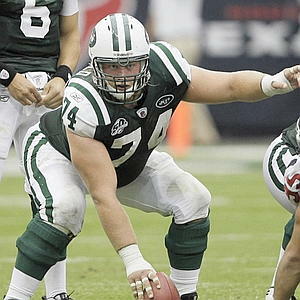 Nick Mangold’s important to the Jets was glaringly obvious in 2011 during the two games he missed through weeks 3 and 4. Versus the Raiders in week 3, the Jets OL allowed sacks to Jarvis Moss, Richard Seymour, Kam Wimbley and Tommy Kelly, and in week 4 at Baltimore they could only manage to help the RBs to a paltry 38 rushing yards in the whole game. Despite missing those 2 games, 2011 saw Mangold voted to the Pro Bowl for the 4th time in a row and First Team All-Pro for the 3rd time in a row. He is currently one of the highest paid centres in the NFL, having signed a 7-year $55million contract, but is he the highest ranked centre on our list…? What can you say about Urlacher? 11 seasons, nearly 1300 tackles, 8 Pro Bowls, 5 All-Pros, an NFC Championship, an NFL Defensive Player of the Year award, a member of the NFL All-2000s Team of the Decade and a member of the NFL 20/20 club (20 sacks, 20 interceptions)! 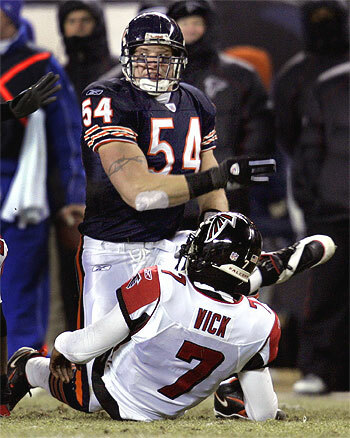 There’s very little doubt with the career that Urlacher’s had, his high character, and his popularity with NFL fans that Urlacher will eventually find himself enshrined in Canton. Perhaps the only reason he’s down at 35 on our list is his age. At 34, his ability as an all-round linebacker is starting to diminish. He still hits like a train, and is the true definition of a leader on the field, but as he finished 2011 being carted off the field with what turned out to be MCL and PCL sprains, the reality that his well-travelled body might be starting to wear out was made very real. In a ranking of the best facial hair in the NFL, Logan Mankins is pretty much a concensus #1 selection. However, we’ve decided to do this list based mainly on playing ability, so Mankins comes in at 34. He joined the Patriots as the 32nd overall pick in 2005, following the Patriots last Superbowl victory. Despite playing LT throughout his career at Fresno St, he was always project as a guard, and he stepped in at LG in New England from week 1. He’s only missed one start due to injury since, but his holdout in 2010 kept him out of the first 7 games of the year. Despite that he was still voted to the Pro Bowl that year, such is the respect of his ability around the league (and perhaps testament to how notoriety will earn you a Pro Bowl slot as an O-lineman over your actual contribution to a season). 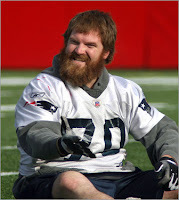 Mankins has shown himself to be somewhat of an ironman with the news that he played through the Patriots 2011 playoff run with a torn ACL that needed surgically repairing immediately after the Superbowl. There’s a chance his surgery might keep him out up to and including the start of the regular season in 2012, but if his career so far is anything to do by, Mankins will be dressed to play come week 1. 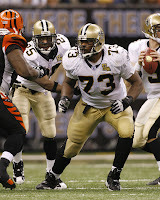 Evans has traditionally been part of the highest rated OG duo in the NFL, with former Saints teammate Carl Nicks. After Nicks’ move to Tampa, Evans is now, well, part of the highest rated OG duo in the NFL, with former Raven Ben Grubbs. 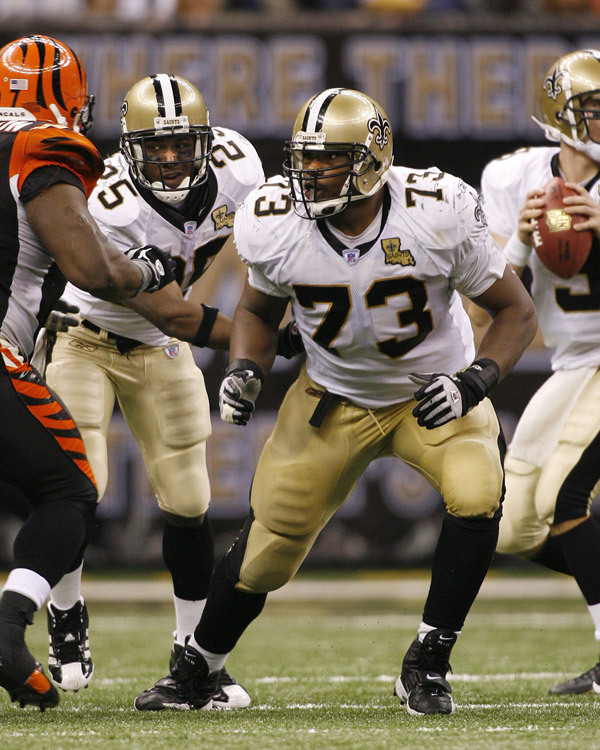 He hasn’t missed a game in 6 years, has been awarded 3 consecutive Pro Bowl and All-Pro berths in ’09, ’10 and ’11, and has a Superbowl ring from the Saints 2009 campaign. What makes all these stats more important is that Evans arrived in New Orleans as a 4th round pick from the tiny Div II Bloomsburg University in Pennsylvania, expected to be a real developmental prospect at LT who may eventually have to kick inside to guard. But when Jermane Mayberry got injured and retired during the Saints ’06 training camp, Evans stepped in to his starting role and never looked back. Foster exploded onto the scene in 2010. The UDFA was almost unheard of before his sophomore season, with just 54 carries and 1 start in his rookie year. 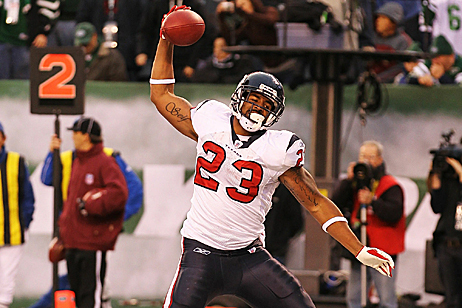 Foster stepped in to replace start Steve Slaton, and in week 1 broke a number of Texans franchise records, with 231 yards and 3TDs. He battled with Jamaal Charles to lead the NFL in rushing for much of the year, and in week 17, trailing Charles, he posted 180yds and 2 TDs to win the rushing title with a total of 1616yds on the season, to go along with 604yds more receiving. These numbers were the highest ever earned by an undrafted player, and earned him a Pro Bowl selection. He started 2011 with huge hopes, but repeated hamstring pulls limited him severely through the first weeks of the season. He returned in week 4 against the traditionally staunch Steelers D, but 155 yards on the ground hailed his comeback. Foster really is a dual threat RB, with the ability to carry to ball over 30 times a game if necessary, but also catch balls out of the backfield and take them to the house – 33TDs in his 3 years will attest to that. 2012 may prove to be a tough year though for Foster, with the departure of Texans RT Eric Winston, one of the best run blockers in the NFL, but with the Texans a hot tip for AFC glory this year, he may just go ahead and post his 3rd consecutive 1200+yd rushing season. Joe Thomas has never had a non-Pro Bowl season. Drafted 3rd overall by the Browns in 2007, he has been voted to 5 consecutive All-Star games, started every single game, and earned 4 All-Pro selections on a roster that has been frankly devoid of talent for some time. Even when blocking for running backs like Chris Ogbonnaya and protecting QBs like Seneca Wallace and Derek Anderson (see, I told you they lacked talent), Thomas has never allowed over 6 sacks in a year, and only been called for a total of 6 holding penalties in his career. In 2012, the Browns offence has got a few new key pieces. Trent Richardson will provide the dynamic threat they’ve lacked consistently, even when Peyton Hillis was powering his way to a 1177yds in 2010. They will also hope Brandon Weeden can be a more threatening presence at QB than Colt McCoy has been. 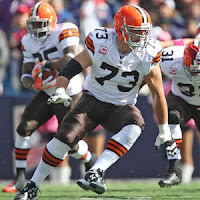 If either of the Browns investments are to have any impact, Joe Thomas will be the reason. Don't forget to check back tomorrow for #30-#21 of our list, which contains possibly the best interior OL in the game, as well as some premier pass rushers... Who do you think is on the list? 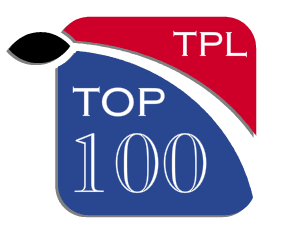 counting on current market trend, the watch nfl games online merchandiser can use totally different set-ups to travel long or short the market. Charting patterns and aras of support and resistance are favored with future traders. mercantilism emini index futures permits for several separate approaches to enter the market as urged higher than. Save the Zebras: a warning to the League office.